Here is one version of onion Chutney that I make for dosas. 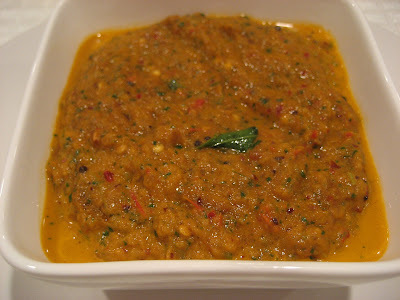 This chutney can be made in a jiffy and it is really tasty. Cut the onions and tomatoes. Heat oil in a kadai . Saute the ingredients in the following order red chillies, onions ,Tomatoes, Corriander leaves. Saute till the onion turns golden , tomatoes softened and coriander leaves gets wilted. Grind together in a mixer with salt. Meanwhile keep oil in a kadai. Add mustard seeds . Once it splutters add curry leaves and hing and return the chutney to the kadai and switch off the stove.